meant to spotlight an upcoming release we are eagerly awaiting! When her mother takes a turn for the worse and the whispers grow too strong for Alyssa to bear, she seeks the origins of their family curse. A set of heirlooms and a moth tied to an unusual website lead Alyssa and her gorgeous best friend/secret crush, Jeb, down the rabbit hole into the real Wonderland, a place more twisted and eerie than Lewis Carroll ever let on. I am loving the dark spins on classic fairy tales, you guys. Especially Alice in Wonderland, which just begs for it. I seriously look forward to the creepy counterparts of our beloved characters -- and Jeb, of course! I WANT these books so bad! Beautiful covers! I ADORE these covers! If only their release dates could be magically bumped up...to yesterday. I hadn't heard of Splintered before, but it sounds amazing! And Alice in Zombieland looks like it'll be a great read too. Both these covers are stunning too! 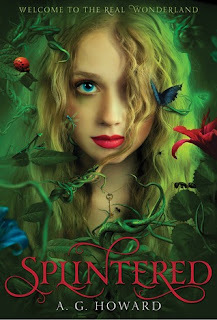 I almost wish I hadn't heard of Splintered yet since we have to wait all the way until next year for it haha. The covers really are stunning! Ahhh I see your URL and totally agree - I want to read 7 Clues to Winning You so badly! That's a great pick. Truthfully, I'm not a big Zombie fan either -- but this cover and the fact that it's Alice (which could lend itself so well to the genre) intrigues me too much to ignore haha. Both of these sound fantastic, but this is the first time I've heard of Splintered and, seriously, wow. I have got to read this one! I cannot believe we have to wait until 2013 for it! Looking forward to both these retellings of Alice In Wonderland and love the covers. Ashley, thanks so much for spotlighting my book! I'm so thrilled with teh cover my publisher gave me! And I love the Alice in Zombieland cover, too. :) The girl's dress is gorgeous! (I'm such a sucker for frills--LOL)and the playing card inset is cool. :) Nice to meet you! You are very welcome for the spotlight, it looks like a phenomenal read! Your cover is so distinct (in the best way) and I so want to know about Jeb haha. I think the playing card inset for Alice in Zombieland is my favourite part...I mean, I love her dress (frills <3) and the typeset, but it's so elegant and Alice-y. Thank you for commenting, and it is wonderful to meet you too! Oh my gosh, YES to both of those! 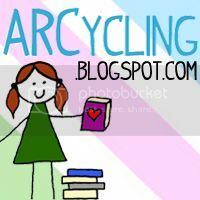 They've been invading the blogosphere like crazy lately and I keep getting more and more excited each time I see them -- they both have such stunning covers and summaries! I love how their both about Alice in Wonderland because that's one of my favourite childhood summaries. So sweet! I think one of the brilliant things about alice in wonderland is how adaptable it is! There can seriously be millions of different things done to the story - Lewis Carroll is pretty timeless and amazing for that. Great picks this week! Both look great. Great picks! I can't wait for both of these! They sound so good and I love the covers. I love that both are incorporating Alice in Wonderland since it is my favorite stories. I love how versatile Alice in Wonderland is. The original is brilliant of course, but how much can be done with it is absolutely amazing! Alice in Zombieland is what I'm waiting for this week too! :) It just sounds so awesome. Yesssss! I say we all petition to have it released like...tomorrow haha. Alice In Zombieland looks epic! Great picks! I am dying to read both of these books! I cannot wait for them to be released. I wouldn't mind skipping a bunch of months just to get closer to their release dates haha. Thanks for commenting! 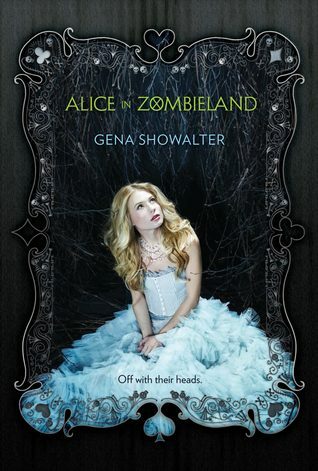 The first book, Alice in Zombieland, looks quite interesting although I've never read anything my Showalter. I've never read anything by Gena Showalter either :( Alice in Zombieland is definitely looking to change that, though! I absolutely adore fairy tale retellings (especially ones with a good twist), so these titles are way up in my TBR list. Great picks, Ashley! OMG this sounds beyond amazing!!! So glad you picked thsi one because I hadn't heard of it before. Now it's gonna kill me waiting till 2013 when it releases. Wonderful WOW pick this week! Reminder: Birthday Giveaway ends Sunday! !